Ducati 848 EVO, the most impressive lightweight Superbike ever with more power from the Testastretta engine and more braking power. It will go on sale at a PRICE of £9,995 for the 848 EVO Dark Stealth version (it includes the stunning new "dark stealth" paint with racing black frame and black wheels) and £10,695 for the 848 Evo. The new Ducati 848 Evo combines a 140hp engine (an increase of 6 HP over a standard 848) with the 848’s legendary (168kg) chassis set-up and planet-stopping Brembo Monobloc brakes. The new superbike will also get twin under-seat silencers, single-sided swingarm, Trellis frame, beautiful race bodywork and steering damper. 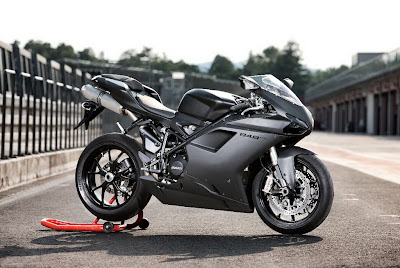 The 2011 848 EVO now further enhances Ducati's most impressive lightweight Superbike ever with more power from the Testastretta engine and more braking power from Brembo’s incredible Monobloc brake technology combining to provide an even more exciting way to enter the world of Ducati Superbikes. The “EVO” treatment applied to the 848 introduces a 6hp power boost to 140hp (103kW) and a torque increase to 72.3lb-ft (98Nm) that results in arazor-sharp and easy-to-use power delivery while the combination of the848's legendary (168kg) chassis set-up and planet-stopping Brembo Monobloc brakes gives unthinkable braking performances most can only dream of. 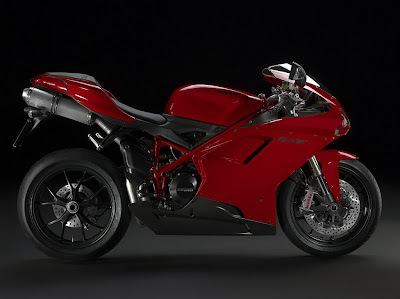 In pursuit of perfection, Ducati engineers have listened to passionate owners of the 848 Superbike since its delivery in 2008 and now enhance its specifications to deliver impressive performances whether riding through mid-town traffic or racing through track-day competition.